The Fiery Bulblax (ヤキチャッピー?, lit. 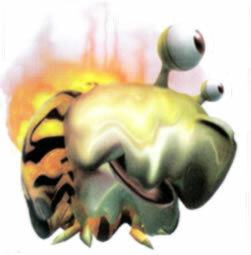 : "Sizzling Chappy") is an uncommon enemy in Pikmin 2. It resembles a small Emperor Bulblax, but with a red fiery backside and meltier features. Only Red Pikmin can withstand the blaze of this creature's body. However, if lured to water, its flames will go out, allowing non-red Pikmin to attack. It is recommended to use a spray against this enemy, as it is one of the most aggressive Grub-dogs. Naturally, Red Pikmin are best to fight this creature due to their immunity to fire. Beat it as if it were a standard Red Bulborb, by peppering its back with a group of 50 or so reds. Fiery Bulblaxes have high HP for a grub-dog and have a fierce shake to fend off Pikmin. An ultra-spicy spray may be desirable for killing it before it can shake off attackers. Swarming a sleeping Fiery Bulblax with 50 or more Red Pikmin can also kill it quickly, but this is riskier since not all Pikmin will latch on to the beast, leaving them more vulnerable. Ultra-bitter sprays are also effective, but it should be noted the Bulblax's fire continues even while the creature is petrified. Sometimes a Fiery Bulblax can only be fought with Blue Pikmin, for example in the Valley of Repose where one sleeps across a small lake. While a Fiery Bulblax is in the water, its flames are extinguished. So lure the Bulblax into the water until it reaches the end of its territory, then charge at it. Since water does not deter the Fiery Bulblax from attacking, it can be tricky to keep it in water without risking Pikmin, so an ultra-bitter spray is recommended here. If Red or Blue Pikmin are scarce in these situations, you can also throw Purple Pikmin, since they will each cause it damage through their smash and have a chance of stunning it. The Purple Pikmin will either be ignited by the flames or—if the Bulblax is lured in water—risk drowning, so this dangerous method must be done hastily if attempted at all. It should be noted that, although Fiery Bulblaxes do not wake up until touched, they are more sensitive than other Bulborbs when returning to their homes, and can stop in their tracks if Pikmin or leaders enter their territory. This can earn you a little time if you attack a returning Fiery Bulblax just as it pauses to notice you. It is possible to kill a Fiery Bulblax with leaders, but without the Scorch Guard upgrade they are in overwhelming danger of getting burned. And even with that upgrade and the Rocket Fist, the task takes so long that it isn't recommended unless you are in a cave, without a time limit. But if you are to beat the Bulblax with just leaders, simply punch the creature and dodge its bites, as with other Grub-dogs. The word "fiery" in its name is clearly due to the fact that it is always ablaze, and "Bulblax" is a different name used for the most powerful Bulborbs. The meaning of the word Bulblax is unknown. Its Japanese name is ヤキチャッピー?, which could be translated to "Sizzling Chappy", with "Chappy" being the Japanese name for Bulborb. Its scientific name is Oculus vulcanus; Oculus is the genus name used in the grub-dog family, and vulcanus is Latin for "volcano". According to an unused early English script in the game's files, the species name was initially going to be volcano. Internally, it is simply called firechappy. Olimar and Louie, next to a Fiery Bulblax in the Perplexing Pool. A Fiery Bulblax in the Japanese version of Pikmin 2. A Fiery Bulblax in the Piklopedia. Another Fiery Bulblax, viewed at night in the Piklopedia. Fighting a Fiery Bulblax in a cave. The creature's e-card, #10 (19th red card). Blue Pikmin safely attacking a re-ignited Fiery Bulblax, due to an oversight. Close-up of a Fiery Bulblax moving about. The Fiery Bulblax's Piklopedia icon is an 80x80 image. This size is only used for bosses. This could mean that at some point during development, the Fiery Bulblax could have been a boss. If a Fiery Bulblax is fought while in water with Blue Pikmin, as soon as it gets out of the water, the fire starts again. However, the Blue Pikmin that are still latched on to its body will not get burned until whistled or shaken off. This page was last edited on February 13, 2019, at 18:21.